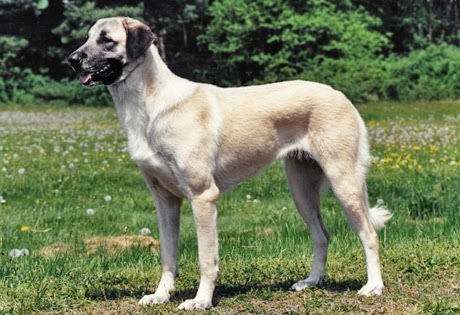 The Anatolian Shepherd is a livestock guard dog that originated in Turkey over 6,000 years ago. The breeders wanted a dog of the same size and color as the animals they protected, so they would be undetected by predators and have the upper hand. These dogs are large and strong - weighing up to 150 lbs - and served as the Turkish sheepherders first defense against predators. They were bred to handle a harsh climate and a nomadic lifestyle. Anatolian Shepherds are known for being loyal, intelligent, independent, and hardy. They're protective, calm, and reserved, and only the family gets to see the dogs' loving nature. They were originally bred to think and act independently, and don't always see the reason in learning to do things on command. The breed was developed to guard and they have a very strong guard instinct. They are currently being used to help protect endangered Cheetahs. Their presence discourage Cheetahs from taking livestock, which solves the problem of Cheetahs being shot by farmers.